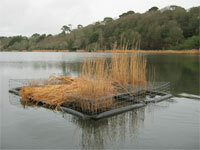 Here is a selection of photos from Swanpool Nature Reserve. Select an album to view more photos in that category. There are even more photos from Swanpool and the Nature Reserve on the Swanpool Beach website including an historic photo archive of the Beach and Nature Reserve, click here to visit the Swanpool Beach Gallery. 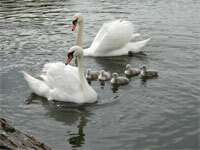 It was all change at Swanpool in 2011 with a new resident pair taking over the territory. 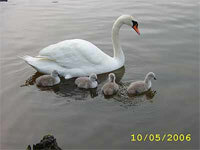 Here are some photos of them and the 2011 cygnets. Gary Thomson and Pete Lochrie putting reed material on the rafts to encourage the swans to use them for nesting. 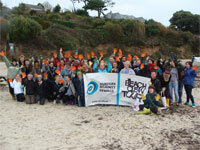 On 5th February 2011 Surfers Against Sewage joined forces with Swanpol Beach and Nature Reserve to remove half a tonne of rubbish from the beach and the reserve. Some great images of the nature reserve by Jonathan Gama-Barata. 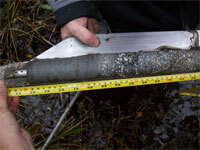 David Morgan (MSc Climate Change and Risk Managment student) studying a sediment core from Swanpool Nature Reserve in 2009. 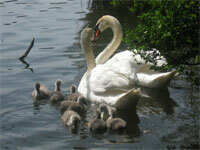 Photos of the Cygnets and nature reserve from 2009. 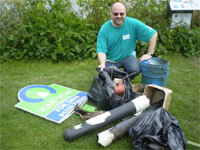 Swanpool Nature Reserve litter pick organised by Cornwall Waste Action in partnership with Swanpool Forum. 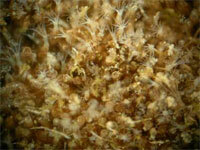 The trembling Sea Mat (Victorella pavida).